Joe Rand is a pragmatist. In a world where everyone, real estate agents included, seems to overshare on social media, he has a word of warning. Joe and Sam are on the same page when it comes to service. 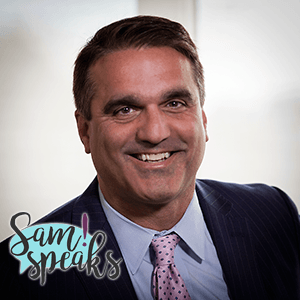 As Sam asked him in this interview, “How can a new agent provide a great experience?” As Joe told her, it starts with service should start before you even meet your client. “I find the best way to make a great experience is to provide information before you even meet them,” he said. The worst thing, as Joe described it, was walking into a client meeting and handing over a pile of paper. That’s not what the first meeting is for. You should already have provided background before you walked in the room. Watch the full interview and subscribe to the SamSpeaks! series as Sam sits down with more thought leaders from the world of real estate and beyond.